A while ago I bought some Secret Key Gold Racoony Hydro Gel Eye and Spot Patches from eBay as I’ve liked under eye gel patches before but they’re so expensive here in the UK. These are a Korean brand and in general cost around £7 – £10 depending on where you get them from. I got them from the f2plus1 eBay store (the eBay store for Beauty Net Korea) and at the moment they’re listed for £8.55. These eye patches contain gold and claim to be good for refreshing your skin as well as hydrating it and improving elasticity. A lot of these patches with gold in claim to be anti wrinkle and with the amount you get in each tub they’re actually quite a cheap way of treating this if they actually work. Each pot contains 60 of the eye patches, the semi circular shaped pieces, and 30 of the spot patches. You can use them daily if you want and then they’d last a month, but I don’t think they’re something that would be part of my daily routine so a couple of times a week makes them last three or four months. This eyeshadow palette review may be shorter than my normal ones, which might be a good thing! The Sleek Makeup i-Divine Eyeshadow Palette in Gleaming Gold was a limited edition palette and I’m pretty sure it was available exclusively in some of the 2017 Sleek Christmas gift sets, though I have seen it popping up on eBay so it may be available if you’re lucky on there. There are twelve eyeshadows in this palette and it’s the standard Sleek Makeup layout with the twelve round pans and a large mirror. They’re all shimmer this time and a range of golden based colours, from an orangey copper to a light champagne colour. There isn’t an official price for this but, going by the cost of other Sleek palettes, I’d guess it’s around £8.99. Looking at this, as first impressions, it seemed like this is one of those palettes you use with another, as everything is shimmery and sparkly, I was expecting to use it now and then and dip into it for a gold colour to add to a look. These are technically two different products but I thought, as they’re both Sleek Makeup liquid eyeliners, they do sort of go together. The first liquid eyeliner is the Sleek Makeup Dip It Eyeliner in Black and the second is the Sleek Makeup Glitter Eyeliner in Gold. I have to admit that I don’t use liquid eyeliner much, or at all really, but that’s partly because I’ve found it very hard to find one that has a brush or applicator that I really like alongside a good formula. I used to love an Avon one I had years ago but haven’t found one since. 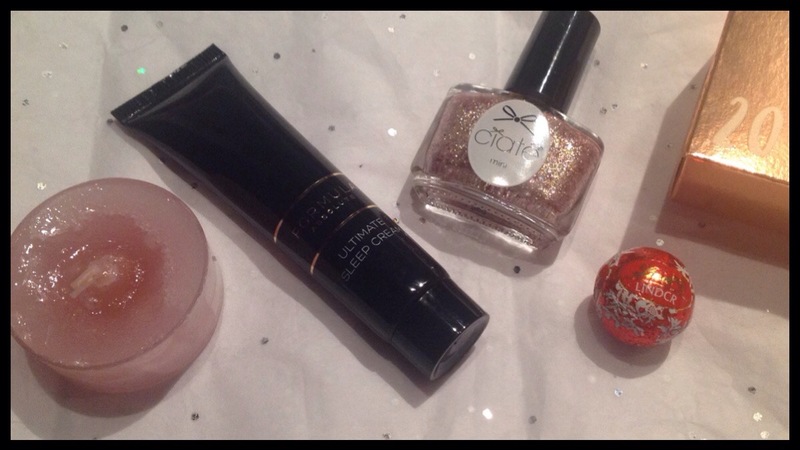 More sparkle in today’s Ciate Mini Mani Month with Antique Broach, it’s such a pretty colour and one I think will work all through the year as it’s surprisingly subtle on a neutral base considering the fact it’s a glitter. The Marks and Spencer beauty advent calendar has a Marks and Spencer exclusive, it’s one of their own brands that I haven’t heard of before called Formula Absolute. It’s the Ultimate Sleep Cream, a night cream for all skin types that I’m looking forward to trying when my skin settles down as it’s really dry in Winter. The Yankee Candle today is Snowflake Cookie, which goes well with the fact we did some baking today, more food making tomorrow getting ready for Christmas as it’s getting so close and we still have quite a few things on the to do list in the build up to Christmas. Happy Halloween! I haven’t really done much today Halloweenish apart from watching an old Hammer Horror movie and apple bobbing. We had some trick or treaters and I may have eaten some of the sweets that they didn’t take. Have you guys had Halloween plans and done anything fun tonight? Or are you going to if you’re in America and it’s still the afternoon. This is only a fairly short post but I wanted to review these while the one necklace is still on the site. I’m not sure how much longer the Halloween range will be up but it’s still there now. 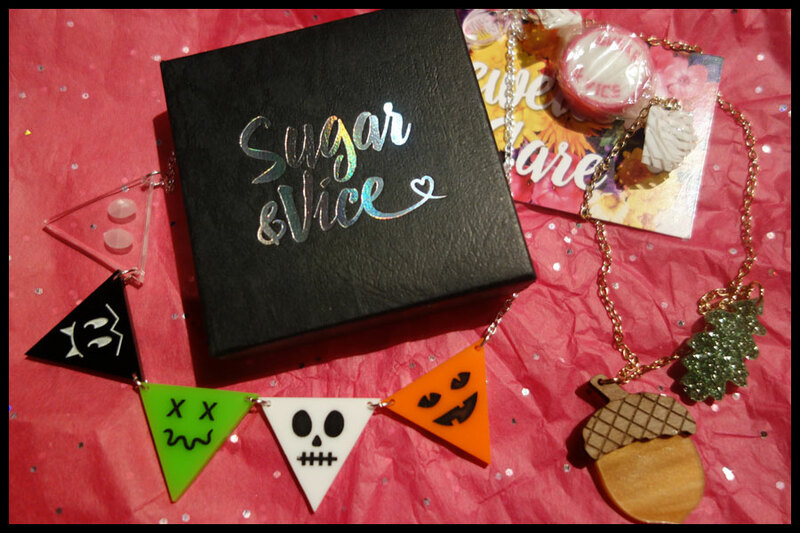 I’ve bought some necklaces from Sugar and Vice in the past and really like the style and the quality is really good. They’re laser cut acrylic shapes which are then used in different types of jewellery, I’ve just tended to stick with necklaces as I prefer smaller earrings and I just wear a greater range of necklaces though I do love some of the bracelets so I might get one of them next.